I wrote about train system in Kyoto before. But I have received many inquiries about Osaka too. I think it is very complicated for travellers from overseas. 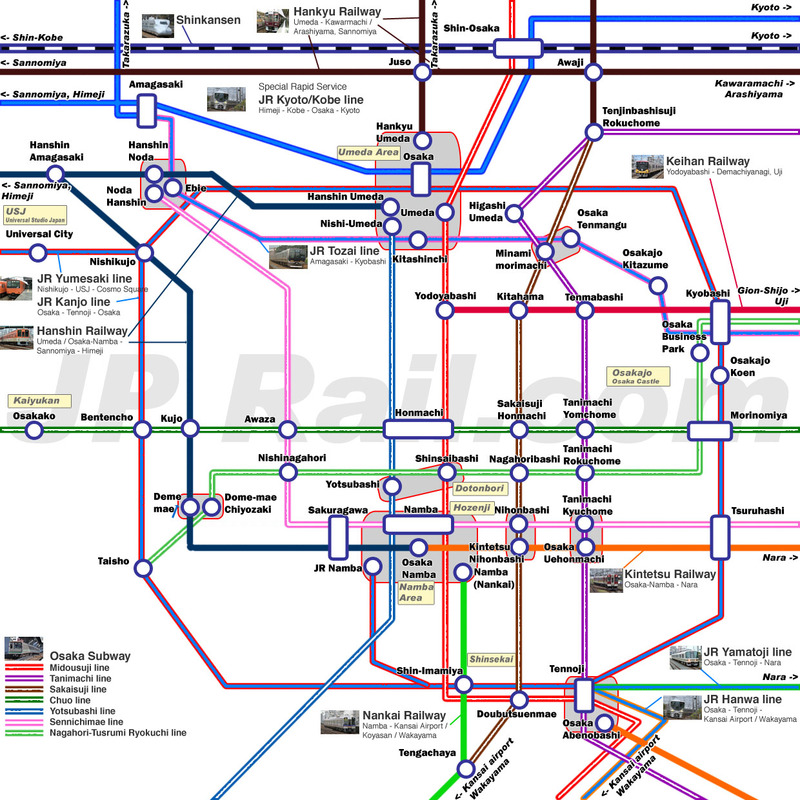 There are three types of railway, JR, Osaka Municipal Subway and Private company’s railways. 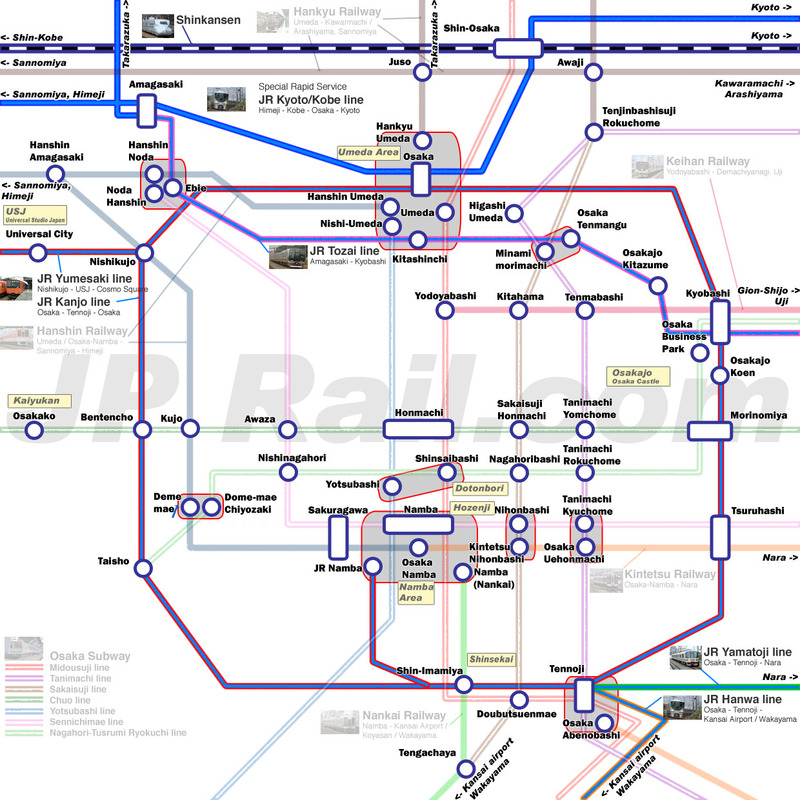 Once you understand train system, you can find the best location to stay, the best deal for trains ride and the fastest way to visit that you want to see. As probably you know, there are many types of deals, such as ICOCA, Kansai Thru Pass, JR Pass, Kansai Area Pass, Osaka Subway Eco Card and Osaka Unlimited Pass. Each pass has different conditions. You must understand the coverage of your pass. 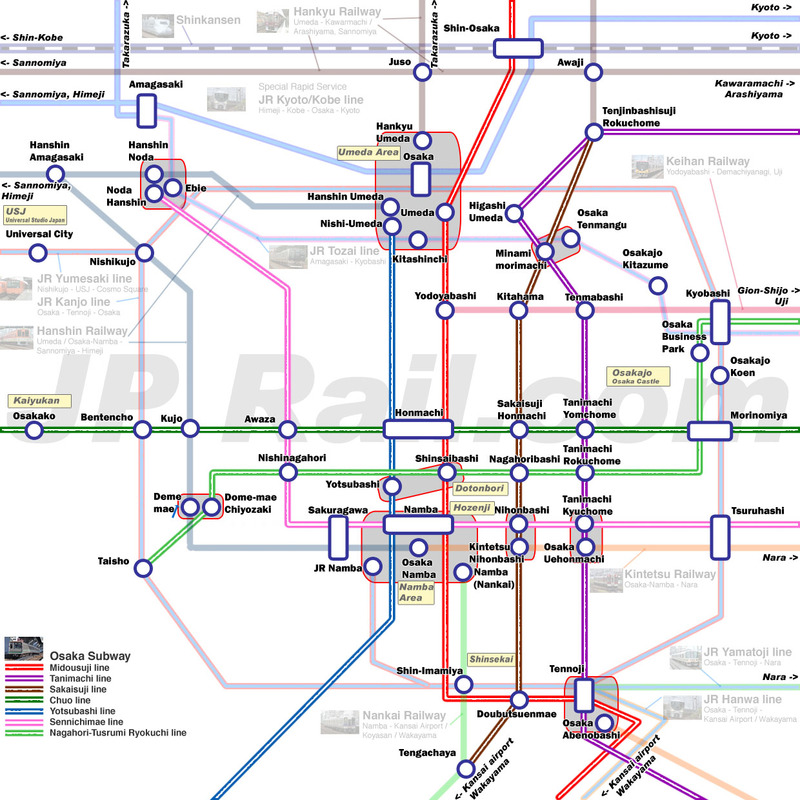 In this post, I tell you about using these deals and explain all train systems in Osaka. 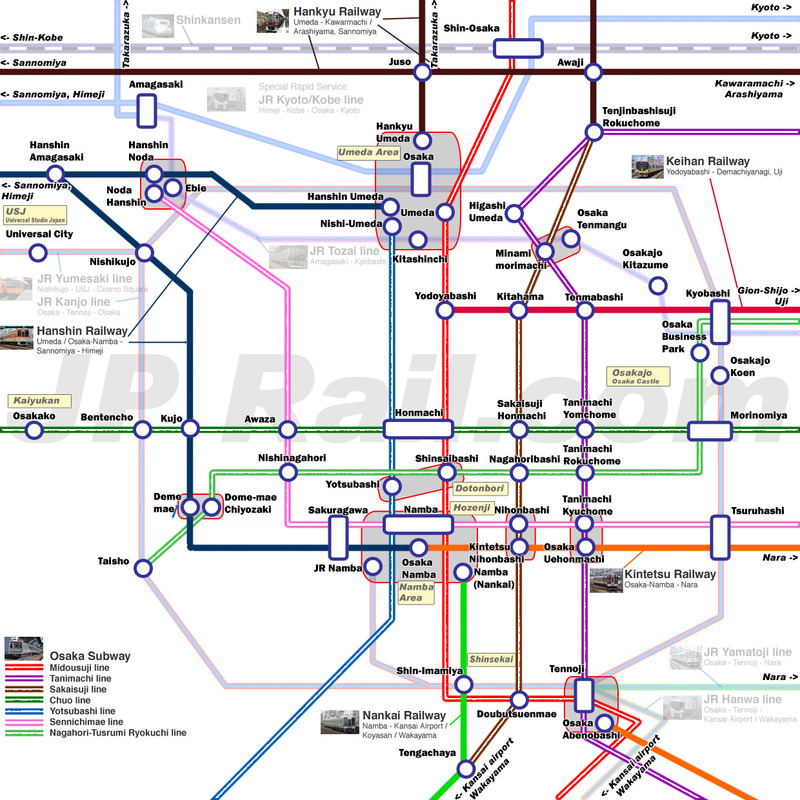 You can take all trains on the map above except Shinkansen. When you travel in Kansai area, don’t try to take Shinkansen for such a short transfer, like going to Kyoto or Kobe. Please see the post, How to transfer among Kyoto, Osaka and Kobe. Compare Japan Railway and private lines. ICOCA does not cover Osaka city bus service too. But I don’t think you have many chances to take city bus in Osaka. You can go anywhere by train services. Train is much faster than bus. Kansai Thru Pass is unlimited ride pass and Rainbow Card is pre-paid card for most of NON JR trains in Osaka. The only place where you can’t go by these deals is USJ. But if you don’t care about riding city bus, you can catch the bus at Nishikujo station. Nishikujo can be accessed by Hanshin Railway that is covered by Kansai Thru Pass. Even if you pay for JR train, the fare is 160 yen foe one way. It is not a big deal. I will explain about access to Universal Studion Japan later. When you go to Kaiyukan and Tenpozan waterfront area, you can’t use these JR train’s pass because there is no JR line there. If you take subway train, the fare from Bentencho to Osakako is 230 yen for one way. Next, in case that you go to Namba, it’s not very convenient. JR has a station in Namba, JR Namba station. But this station is not located in the center of Namba. Nankai Railway’s Namba station, Subway Midousuji line Namba station and Osaka-Namba station (Hanshin and Kintetsu) are very closed each other. But JR Namba station is 1km away from Nankai Railway’s Namba station. If you walk, it takes at least 15 minutes. And also when you go to Namba from Umeda area, You have to take Osaka Kanjo line from Osaka to Imamiya and need to transfer to the train to JR Namba. It’s a big detour and much longer trip than Osaka subway Midousuji line. I cannot find any reason to avoid paying only 230 yen fare to take subway from Umeda to Namba. Enjoy Eco Card covers Osaka subway and city bus. Osaka Unlimited Pass includes unlimited ride of subway and bus, and free admission for major attractions in Osaka. There are one day and two day available. But coverage is a bit different. One day covers subway, bus and major private railways, like Hanshin, Nankai, Keihan and Kintetsu. It is very similar to Kansai Thru Pass. But two day pass covers subway and bus only. When you choose this deal, please make sure your itinerary and which train you need to get on. As long as you can take subway, most of places can be reached by subway. Most of places in Osaka can be accessed by train. I would like to share the information of access to major spots with you. You can reach Namba by many ways. As I mentioned above, JR Namba station is not located in the core of Namba. JR Namba is closed to Subway Yotsubashi line Namba station and Sennichimae line’s Sakuragawa station is actually closer than Namba station. Nankai Railways is the best way to get Namba from Kansai Airport. And also train runs to Mt. Koya. Hanshin Railways and Kintetsu Railways trains go through each other. And their station is “Osaka-Namba” station. When you search on Hyperdia, you can find Osaka-Namba. It’s not Namba for these train companies but Osaka-Namba. If you stay in Namba and want to go to Nara or Kobe, you can use these train companies. You can go there directly from Namba. Shinsaibashi is one station away from Namba by subway. But Namba and Shinsaibashi are connected by shopping arcade. Dotonbori is located between Namba and Shinsaibashi. And also Shinsaibashi is connected with Yotsubashi and Nihonbashi by underground. So most of places in Namba can be accessed by walk. Umeda and Namba are two biggest downtown core in Osaka. There are many department stores and shopping complex in Umeda area. In Umeda area, only JR station is called “Osaka”. JR Osaka station and other railway’s Umeda station are located in same area. There are many stations in Umeda. Please see the post, Osaka station guide. How to change JR trains, subway trains and other private railways – See more at: https://jprail.com/destinations/kansai-area/osaka-station-guide-how-to-change-jr-trains-subway-trains-and-other-private-railways.html to get more detail about Osaka and Umeda station area. Osaka Subway Chuo line’s Osakako station is the nearest station. You can catch Chuo line’s train at Honmachi, Bentencho and many other places. If you stay in Umeda or Namba, simple take Midousuji line or Yotsubashi line train and transfer to Chuo line’s train at Honmachi. If you are JR Pass user, you can get Bentencho by Osaka Kanjo line from Osaka or Tennoji. You have to pay extra on top of your pass for taking subway from Bentencho. USJ is located just across the river. But there is no direct train or bus. Please see next chapter to get USJ from Tenpozan. JR Yumesaki line’s Universal City station is the nearest station. There is no subway or private railway’s service available. If you are not JR train user, you can catch the pass to USJ at Nishikujo station. If you want to access to Tenpozan/Kaiyukan from USJ, shuttle cruise service is the fastest and only direct way to connect both places. Otherwise you have to take Universal City station – Nishikujo station – Bentencho station – Osakako station route. It is a big detour. There are several stations around Osaka castle. You can access there from Tenmabashi station (Keihan Railway), Tanimachi-Yonchome station (Subway Tanimachi line), Osakajo-Koen station (JR), Osaka Business Park station (Subway Nagahori-Tsurumi Ryokuchi line), and Morinomiya station (JR). The nearest stations to access to the castle are Tenmabashi and Tanimachi-Yonchome. Other stations are okay, but these stations are closed to Osaka Castle Park. Shinsekai is old town of Osaka. There is very traditional shopping arcade. Tsutenkaku tower is located in Shinsekai area. This area can be accessed from JR and Nankai Railway’s Shin-Imamiya station. Minoo is located outside downtown Osaka. Most of city deals, such as Osaka subway pass does not cover Minoo falls. Only Kansai Thru Pass covers this falls. In peak season, like fall foliage season, direct train service runs between Umeda and Minoo. This museum is located outside downtown Osaka either. Most of city deals, such as Osaka subway pass does not cover this attraction. Only Kansai Thru Pass covers the trip to Instant Ramen Museum. You need to take Hankyu Railway Takarazuka line train from Umeda to Ikeda. Trip time is around 20 minutes from Umeda to Ikeda. Let’s say I bought Icoca from the machine already and I am travelling from KIX to Osaka first. My last day will be in Kyoto and I want to go back to KIX from Kyoto Station. So I read that Haruko can be bought as discounted ticket. So how do I get that discount and where should I buy that ticket? I know if I buy from the machine, I need to buy the full price ticket. You can purchase it at the ticket window in Kyoto station. I am going to Osaka for the period 16 – 27 Nov.
Day 2, 17 Nov – morning to explore around Dotonburi while waiting for daddy to reach in the am flight around 9.45am. Your trip plan looks good. You are ready to go. We will be arriving in Kansai Airport on 25 Oct 2018 evening. We have already purchased train round trip ticket from Kansai airport to Namba station and then from Namba station to Kansai airport via Nankai Line Airport Express train. We have also bought Icoca cards to travel around. But we are unsure if the Icoca cards can help to save us some transport cost. I was thinking about the Day Pass. Please advise if we should purchase Day Pass instead. Our itinerary is simple, 3 nights in Osaka (hotel near Namba station) and 3 nights in Kyoto (hotel near Kyoto station). Our reason to go to Kyoto is because we will be visiting Tori Ryori Seto とり料理 瀬戸 to sample the one-Michelin star chicken. We like to do more shopping and eating. We are interested about the bamboo forest and one or 2 shrines in Kyoto. We will appreciate your good recommendations on the good shopping and eating places both in Osaka and Kyoto. In Osaka, if you visit 3 or 4 places a day, you may use day pass instead of using Kansai one pass. Please see the link below to find more info about the deals in Osaka. In Kyoto, I think Kansai one pass is okay. But you may use city bus pass. Because you can get the worth of it by three rides a day. What ticket/pass would you recommend for our itinerary. We are planning to buy Osaka Amasing pass for our Day2. Next Next post: Complete access guide to Ghibli Museum from Tokyo and Shinjuku.